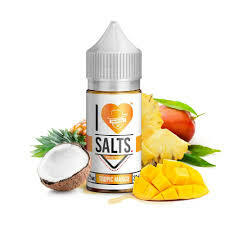 I Love Salts E Liquid makes vape juices that are produced with salt nicotine to make some of the most delicious flavors imaginable that not only deliver on taste but with that nicotine that you crave at the same time. With more impact per inhale, using blends that are made with salt nicotine is the way to go if you are trying to kick the habit. Used in a Smok Infinix, 50mg — I hoped the flavour would be more pronounced, but this e-liquid is very subtle. I don’t taste the coconut and pineapple that much, but the mango is definitely there. This will be my all day vape. Love it. This one is almost as good as the Red Mango. Definitely more subtle.